Spanish fathers and fathers’ groups based in Spain would strongly reject any suggestion that the country enjoys any form of shared parenting. Yet as this student’s thesis shows it is theoretically permitted in Spanish law. The convoluted progress towards shared parenting is as intriguing as the reasons given for why it has not been implemented. The following article is a summary of Spanish law based on a law student’s perception of shared parenting in Spain. A comparative study undertaken by Andrina Hayden, for a PhD [ see Comment below] has concluded that there are both similarities and differences in shared custody to be found in Spain and England. However, in coming to the conclusion that England is ‘well advanced’ in shared custody matters one feels she is relying solely on the ‘letter of the law’ and not how it is practiced every day of the week. This last observation is no where near the truth. Spain is divided up into several autonomous regions (comparable in some way to the limited self-government found in Wales and Scotland). 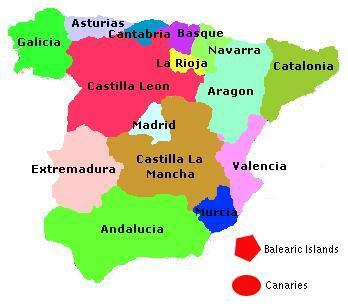 One of these autonomous regions is Aragon. In May 2010 it passed legislation to make possible shared parenting as the preferred option. Not only that but whenever separating or divorcing couples could not agree on custody matters this was to be the state’s preferred default position. Another autonomous region, Catalonia, implemented a similar Act in July 2010 requiring judges to award custody according to the shared nature of parental responsibilities where an agreement between parents could not be reached (Article 233-10 (2) 25/2010 Act). Other regions in Spain are expected to follow suit, eg Navarra. The overall impression given is one of Spanish parents coming to shared parenting agreements outside of the court or without the need of a court order (as a court will inevitably order ‘shared parenting’ if parents cannot agree which will force one or both parties to be more realistic). Andrina Hayden writes of the “. . . . deep rooted tendency of the Spanish courts to award custody to just one of the parents” [ i.e. the mother ? – RW ] when agreement between parents cannot be reached. She sees the Aragon Parliament’s decision as having a “ground breaking effect in Spain.” However, this is tempered by her observation that jurisdictions in the rest of Europe have long accepted that joint custody is in the best interests of children when parents divorce. Historically, the Spanish Civil Code of 1889 anticipated that in cases of separation and divorce, the allocation of custody would be determined by the age and gender of the child concerned. In this way, sons and daughters under the age of seven always remained in the care of their mothers (in the US the equivalent is termed the ‘tender years doctrine’). From the age of seven upwards, the test of good faith or the innocence of the respective spouses in annulment or separation came into play (this test also played a significant role in UK custody awards before 1945). Perhaps because of the influence of the church in Spain both parties were deemed innocent and to have acted in good faith; sons remained under the custody of their fathers and daughters with their mothers (this was not true in the UK). Between 1981 and 1990 the first signs of change began to take place. After 1981 a clear preference existed for the mother to gain full custody. This was based on the settled psychology prevailing at the time that considered the maternal figure as the most suitable to care for the child. A second stage emerged between 1990 and 2000. The Civil Code accepted the principle of non-discrimination and brought to an end the discriminatory criteria used in child custody awards that disadvantaged fathers. The third and final stage in Spanish child custody law began in 2000 and continues to the present day. Legislators consider it “progressive” as it is said to acknowlwedge the movement towards shared custody (shared parenting). However, that progressive vision encompasses ‘visiting rights in favour of the non-custodial parent’ which by implication underscores a subservient role and cannot be seen as a ‘progressive’ step. Although the law is now neutral and presumes that both parents are equally capable of raising children, Spain’s visiting rights emphasises a second class status should, which by 2000 should have been consigned to the dustbin of reactionary gender stereotyping. The third stage concluded with the passing of an Act (8th July, 15/2005) modifying the Civil Code relating to divorce and separation. The “Ley de Enjuiciamiento Civil” introduced the notion of shared custody into the Spanish legal system for the first time (see Article 92 CC). Henceforward, ‘shared child custody’ was to be awarded when applied for by both parents in the stipulated manner. This involved both parents agreeing to the same course of action. In common with some other jurisdictions the judge that awarded the shared custody also had to provide ‘justification(s)’ for his decision. From shared parenting’ Hayden suddenly and confusingly switches to ‘alternating orders’, which carry the connotation of the ‘alternating residence’ orders to be found in Belgium (see “Belgium Chooses 50/50” http://fkce.wordpress.com/2009/09/16/00031/ ). It is this leap – from shared parenting to ‘alternating residence and care’ – that is the stumbling block across the EU. The argument in favour of shared parenting has been won (even if it has not been implemented), however, it is the idea of a child ‘alternating’ between two addresses during the wek which has provided opponent with ammunition to prevent full shared parenting. Those in control of policy making see shared parenting in terms of “shared joint parental responsibility” – simply a legalistic and terminolgy change. And generally speaking this status has already been achieved across the EU. The problem with this legal status is that it is one handed down to a citizen by the state. It is therefore revocable by the state at any time – parents essentially only have children ‘on licence’ from the state. It is not ‘an inalienable right’, to quote our American cousins. The pivotal role that ‘alternating residence and care’ plays can be gauged by the ‘denial’ it encounters in also most every EU country. The present difficulties and scepticism in official circles in the UK are hinged on the premise that alternating residence is unsettling for the child. The assumption in official circles is that it is key for children to have a stable home and alternating residence and care’ directly undermine that goal (see Lowe 2009, p. 2). Having found ‘parental responsibility’ itself difficult to define she resorts to relying on principles from the Commission on European Family Law (CEFL). It is helpful to consider how the term has been conceptualised in a broad sense by international texts, such as the Principles of the Commission on European Family Law (CEFL principles see http://www.ceflonline.net/). Those CEFL principles include a collection of ‘parental rights’ and ‘parental duties’ aimed at promoting and safeguarding the welfare of the child (principle 3.1). In Spain, ‘parental responsibility’ is not defined in law; however, patria potestad (roughly equiv. to ‘parental authority’) is recognised in legal writings as a collection of powers and duties over a child and the child’s property. This might equate to ‘custody’ in the pre-1989 Act situation in England. But unlike England, this authority is vested equally with the child’s father and mother. Patria potestad unlike England is unaffected by divorce, separation or annulment. (The counter argument is that today’s ‘parental responsibility’ in England is equally unaffected but see below). Hayden correctly identifies the Children Act 1989 (operational Oct 1991) as the main controlling statute. The Act’s decisive ambition she identifies as the replacement of the concept of parental rights in favour of ‘children rights’ – but to be exercised by the court. Parental rights and duties are thus conveniently replaced by the concept of ‘parental responsibility’ favouring the child and enforced against parents. Section 3(1) of the Children Act 1989 states that: “parental responsibility” means all the rights, duties, powers, responsibilities and authority which by law a parent of a child has in relation to the child and his property.’ But comparing it with guardianship rights, which preceded it, certain key component are missing, e.g. a father is no longer the legal guardian of his legitimate child. If a fathers is no longer the child’s legal guardian, then who is ? No one seems to know. It is at this juncture that Hayden gets into a hopeless mess and her carefully woven thesis begins to unravel. She sees Section 2(1), of the Children Act 1989 as not being in conflict with Section 2 (7) or clashing with Section 3(1) when they clearly are. Together with Section 1(1) she sees them as working harmoniously when they do not. She then avoids lurching into the retreat of many a scoundrel by not believing that the concept of custody is equivalent to parental responsibility. Neatly she summarises that the concept of custody, i.e. physical custody, is displayed in all the parental duties that require constant day-to-day care of a child and establishes where a child will live. The two stages of custody in Britainprior to the Children Act 1989 was, 1). custody and 2). care and control, and it was the latter that was key. A parent with physical custody has every right to expect to have his/her child live with them but a parent with parental responsibility does not have the right to demand to have his/her child live with them. Visiting rights are granted by a parent with physical custody and accepted by a parent with parental responsibility. So the two are not equal or interchangeable as some would have us believe. Like an epiphany Hayden makes the link – the inextricably deceptive link – between parental responsibility and custody. She realises that compared with parental responsibility, ‘custody’ can only be understood as having additional functions (Gilarte Martin-Calero, 2010, p. 4). But there are no provisions in parental responsibility to enable those absent ‘additional functions’ to be added back in. In Spain, the terms guarda and custodia are interchangeable and refer to the same thing, namely the physical personal care of a child. Hayden believes that in Spain it is possible to have custody attributed to one parent with parental responsibility to continue jointly and / or be shared by both parents. In so doing she underlines the dichotomy that has yet to be realised in other EU countries. The English equivalents, guardianship and custody are, in the post Children Act 1989 era, quite separate. In England, the new legal term – under the banner of joint shared responsibility – is ‘Residence’ to refer to the person with physical custody. Guardianship has been totally abolished by law. The term ‘custody’ is frowned upon as devisive, so the public is left with a new terms and phrases the meanings of which they are none too sure about. Hayden then makes the mistake of stating that if a court grants a ‘residence order’, parental responsibility will automatically be given to that aprent and to the other parent. But the CA 1989 allows for ‘any order’ and ‘no order’ orders to be made and so her assertion is not entirely true. It is a matter of public record that Hayden’s assertion that, “traditionally, the regulation of child custody on separation or divorce was resolved by attributing custody to only one of the parent” (“unilateral custody” or “sole custody”) is wrong. It is a common mistake made by all commentators who have not delved deep enough into the archives. Law Commission Report No 96 (Supplement to Working Papers) is the paper overlooked every time. It reveals that during the 1980s joint custody was as high as 50% in some areas of Britain. The default position that has been allowed to grow in Britian is one where ‘mother sole custody’ accounts for over 95% of residence awards, ie custody. The inadequacies of this model were shown by Lathrop Gomez, (2008, p. 275) and Martins (2005, p. 225). The Children Act 1989 fails in protecting and promoting the best interests of the child – particularly in regard to ‘the right’ to grow up and maintain contact with both parents as enshrined under Article 9, paragraph 3, of the United Nations Convention on the Rights of the Child (1989). “Parties shall respect the right of the child who is separated from one or both parents to maintain personal relations and direct contact with both parents on a regular basis, except if it is contrary to the child’s best interest”. Being a relatively new phenomenon (ie overt fatherly involvement in child rearing and shared parenting), different countries have adopted different phrases for essentially the same thing. Joint legal custody is in reality a ‘token’ and no more than sole mother custody. The American term joint physical custody equates to the British jont custody (i.e. we have never had just joint legal custody). The striking difference between UK and US is this truer sharing of custody as outlined above. In the UK the new term of “shared residence” has replaced joint custody and is used to refer to the legal status recognising that a child has two homes (‘residence’ replaces custody, care and control). However, both descriptores have been criticised in Spain because, it is argued, they do not respond to the dynamic that the term is actually referring to, namely, custody is neither joint nor shared, it is an alternative. For this reason it would arguably be more accurate to speak of guarda or custodia alternative (Guilarte, 2008, p. 13). The term ‘alternating residence’ is used in Belgium for their new custody legislation and this can probably be attributed to the CEFL’s. choice of wording. Shared custody has increasingly risen in status to the extent that it is now taking preference in a number of countries. The trick is to convert this groundswell into legislation. The reason why shared parenting is gaining in populatity is simply because it is more in tune with the times. It better reflects the rights of the child and the fathers and is more in tune with the aspirations of society and young families. The classic argument against shared parenting is that it upsets and unsettles the child; allegedly it knows not one stable, unaltering home. Hayden shows that the alleged lack of stability for the child is neither a fundamental nor decisive reason for justifying the denial of shared custody (ref. Spanish Supreme Court, STS, 1st, 8.10.2009). Stability, as an issue, can no longer be interpreted to mean that a child should not be moved from one household to another. In spite of this so called “new interpretation”, there continue to be cases in the ordinary Spanish courts where judges reject ‘shared custody’ as something that does not provide a stable environment for a child. In response to this, the Spanish Supreme Court is planning to educate the lower courts about the positive values of shared custody. Article 90 II CC sets out the standard required in Spanish law for parents who have reached an agreement for shared custody. This states that a judge should award shared custody except where it would be harmful to the child or seriously prejudicial to one of the parents (i.e. the usual caveats). Article 92.7 CC specifies theses exceptions (to an award of shared custody) and include allegations of domestic violence, sexual or general violence and assaults upon a person’s moral integrity etc. Spanish custody laws have come in for a lot criticisms, the greatest being reserved for situations where judge faces difficulties caused by parents who cannot agree. Some jurisdictions have found ways of managing this situations, ie where parents cannot agree on either the principle of the the terms of shared parenting. Those jurisdictions simply impose a rigid 50 / 50 split and the thought of the inconvenience this will cause to one or both parties quickly sobers them up. Perhaps the most controversial element in the current Spanish model of shared custody is the regulations that permits shared custody to be awarded even when there is disagreement (ref Article 92.8 CC). A similar role to that assumed by CAFCASS in the UK is ascribed to the “Public Ministry” in Spain. Consequently, at the request of the party with the favourable report from the Public Ministry, the judge can award shared custody “on the basis that it is only in this way that the best interests of the child be adequately protected”. This would never ne allowed to happen in England. Denial of shared custody is theoretically no longer possible in Spain because, at so many levels, a formal recognition of shared physical custody exists. The previous ambiguity caused by the law not prohibiting but not recognising shared custody either has thus been snuffed out. Sabotaging shared custody is of course still possible by the need to acquire a favourable report from the Public Ministry. Many cases, when shared custody could have been appropriate, have been frustrated by parents not agreeing over custody (ref. Article 92.8). Adoption of shared custody can also be stimyied by the double lock system contained in the Act’s wording. One key is firmly in the hands of the Public Ministry and the other key in the hands of the presiding judge – both have to be turned together. The veto power of the Public Ministry is said to makes some judges feel they are not longer in control of their own courts (and given the exceptionally perverse, even hair raising way Spainsh courts administer allegations of domestic violence, judges are perhaps rightly concerned about the dictates of bureaucatic interference if not a take over). The upshot of the above is that shared custody rather than being a universal award, as planned, can in fact be considered a rare outcome. In that regard it is not dissimilar to ersults Britain where the wording and legislation is already in place but the judicial will to invoke it is missing. In both countries it appears to be only the Higher Courts that are prepared to give consideration to the criteria set out and award shared custody. To compliment the action by Higher Courts there are signs of movement in this direction especially in some autonomous regions of Spain where legislative steps have begun (see ‘Spanish legal background’ , above). Hayden reasons that Aragon’s decision is significant and is a landmark because it is the first Spanish region to give ‘shared custody’ (shared parenting) such a high preferential, even universal, rating. Instances where shared custody is not possible will nonetheless still require that a regime of communication and visits with the other parent has to be guaranteed so that parental responsibilities can function properly. A few months afterAragon’s legal change Catalonia followed suit with a similar custody law (July 2010). Catalonia’s law is more conservative and is said to be not so radical as Aragon’s. Although Catalonia is now in favour of shared custody the main difference is one of implied rather than a more formal preference for shared custody. If there is no agreement between the parents in Catalonia, the judge is directed to award custody according to the shared nature of parental responsibilities. This may seem a detail but since Catalonia has legislative competence over its own civil law, judges have always had the freedom to decide cases on shared custody without being bound by the Public Ministry report. For those interested in the detail, Article 233-11 of the 25/2010 Act sets out the criteria to be taken into account when determining the exercise of custody. The list of criteria includes items not found on the Aragon list. Dutifully Hayden’s paper reiterates the stated law as it theoretically applies in England. She correctly identifies the Children Act 1989 as having the most transforming effect of any law, however, she is deluded by the accompanying propaganda. Hayden cites the Law Commission’s “Review of Child Law: Custody”, (Report No 96), of 1986, but in common with other researchers is totally unaware of the “Supplement to Working Paper No. 96” written by J. A. Priest and J. C. Whybrow (see Custody Law in Practice in the Divorce and Domestic Courts, 1986). The full text of this, a Law Commission survey into custody practices, is only available at: http://lawcommission.wordpress.com/1986/10/01/00001/ since the archivists at the Law Commission were unaware of its existence until my enquiry of a few years ago. (It is not available on the internet and is not listed by the Law Commission as a published report). “Supplement to Working Paper No 96” (SWP 96), is the custody report time forgot; it tells us that it is the first time that the judiciary had looked at itself and its custody award patterns. SWP No 96 tells us thatnot only is it the first time that the judiciary has looked at itself and into the custody patterns it generates, but that there is a distinct North-South divide over the preferred way that parents arrive at custody choices. Law Commission misinformation also extended to claiming that there was “a tendency amongst parents” to be litigious and thus clog up courts unnecessarily with spurious claims. We know that the Law Commission is capable of deliberate misinformation because a former Commissioner (Ruth Deech) has admitted it and explained how it was done. Scanning the annual number of CAFCASS reports and the applications for contact (visitation rights) parents are far more litigious today. Had the Law Commission noted the survey results shared parenting would probably have resulted in far fewer applications. SWP 96 highlights the very different personal attitudes which judges bring to custody awards. In the 1980s some judges saw no point in shared custody (then joint custody) while others found it to be the best and most harmonious solution (see Harris and George, 2010, p. 169). Whatever the arguments for and against joint custody they were annihilated by the Children Act (CA) 1989 – joint custody was effectively wiped off the landscape. The Children Act 1989 was custody’s “final solution.” Devised by the Law Commission it eradicated guardianship, custody, and 1,000 years of parental rights. In effect it orphaned every child from its family. From 1989 onwards the state and the courts reserved the right to “intervene” at any time. Having been stripped of their fundamental human rights to be parents, the state felt obliged to offer something in return – that something was quasi-custody in the form of “parental responsibility” – a somewhat ethereal notion. The CA 1989 also introduced the concept of “residence orders.” Intended, we are assured, to “concentrate the minds of the parties and of the court on the concrete issues relating to the day-to-day care of the child.” It did nothing of the kind – it polarised the situation into sole mother custody. A ‘residence order’ (often referred to a Section 8 order) is rigid in that it signifies in absolute terms the one person “with whom the child is to live”. It created a winner and a loser. There is the academic and abstract nicety of Section 11 (4) which provides for a residence order to be made in favour of (not one) but two or more persons (who may not all live together) but they are so rare as to be an extinct option. In theory a Section 11 order can also “specify the periods during which the child is to live in the different households concerned” but that doesn’t happen either. Section 11 makes clear provision for a child to live with either or both parents even though they do not share the same household. This is underscored by the implications of the Interpretation Act 1978 – but again, this makes little difference (see Lowe, 2009, p. 4). It is somewhat ironic that the Law Commission’s proposals (which were later to become the CA 1989) drove joint and shared custody into extinction yet perversely the Law Commission beleived, “it would be a far more realistic . . . . to make a residence order covering both parents” , i.e. joint and shared custody. Ostensibly the whole purpose of the CA was the reversing of a pre-Children Act 1989 decision in Riley v Riley. For those not familiar with (Anglo-Saxon) common law and statute law when a ‘precedent’ ruling has been set by the high courts all lower courts must follow the example (sometimes referred to as ‘case law’). Riley v Riley was a ‘precedent’ case and stated that courts could not, as a matter of principle, make what is now known as a shared residence order. The CA 1989 should have neutralised this old case law and overturned Riley v Riley type cases. Shared residence order should have become de riguerre after 1991. But this never happened and England is still stuck with the Riley v Riley case law. We have to be very grateful to Hayden for unearthing facts some of us have spent years trying to confirm – namely the official reason why shared parenting was never adopted by the courts (see reference to Health Minister, John Bowis, MP at http://motoristmatters.wordpress.com/2010/07/02/12/). Thus the riddle is solved of why shared custody never happened in England. The source cited is “Department for Children, Schools and Families, The Children Act Guidance and Regulations, Vol. 1, Court Orders, § 2.23.” (NB. Vol 2 – 5 deal with public law scenarios). The Children Act was implemented in 1991 and for the remainder of the 1990’s shared residence orders were seen to be restricted to cases where exceptional circumstances existed – Re H (A Minor) (Shared Residence)  1 FLR 717. Hayden correctly identifies that shortly after the CA 1989 came into force ‘the authorities’ through official “Guidance Notes” made clear their negativity towards shared parenting (shared residence). She describers the recommendations contained in the passages as “negative tones”. Unfortunately for her PhD, Hayden fails to differentiate between routine cases and the exceptional ones that go to the High Court and then still higher to the Court of Appeal where shared residence stands a better chance of being granted. Under that misapprehension she concludes that shared residence has evolved from a rarity into a common or “must have” custody order (and she cites Hale and Wood, 2007, p. 11), when, nationally at the lower court levels, the very opposite is true. Bizarrely it was the Law Commission who saw the rise in shared residence orders as reducing conflict between parents, so why did the Dept of Health not heed this advice ? Hayden quotes Lowe (2009, p.6).who believed that this model of custody would probably go beyond what the CEFL had in mind for Principle 3.20 (2)(b). The fact that on July 13th 2010 a Private Member’s Bill (PMB) in favour of shared parenting and providing for the making of shared parenting orders following separation or divorce reveals how moribund shared residence orders have become nationally. Some jurisdictions have chosen to adopt the alternating residence form of shared parenting, e.g. Belgium. This option meets with more resistance in some quarters than shared parenting, yet it has been shown in an English ‘test case’ that the CA 1989 is capable of such flexibility. A good example of the courts creative approach is demonstrated in Re F (Shared Residence Order). The mother proposed to relocate toEdinburgh, Scotland from the South of England (approx 1,000 km). The father had resigned from the navy before trial, meaning his plans were ‘fluid’ , The father also proposed to relocate to Scotland facilitate the sharing arrangements. The trial judge made a shared residence order. A legalistic justification for not granting shared residence (joint custody) in England is encapsulated by Justice Hale (aka Brenda Hoggett, formerly of the Law Commission) in her ruling in Re A (children) (shared residence), she reminded the court that a residence order was all about ‘where and with whom’ a child was to live – it was immaterial how long a child spent with the other parent or whether that amount of time amounted to shared caring / parenting. In the final analysis and despite certain minor variations there is little to choose between the regimes in both countries. Inevitably there are occasions when both systems appear to fulfill their promise but overall the products they manufactured are not whatare wanted by the public. Hayden believes that the English position in relation to shared custody has developed in a way that has enabled judges to be flexible and creative in their approach to shared custody. But the contrary view would be that this flexible and creative approach to custody has actually been used to thwart shared custody. The perceived benefits Hayden sees of having a legal system that refuses to accept that “one size fits all” enables the judiciary to deny the fact that each child has basic ‘needs’ (food, shelter etc) followed by elementary ‘wants’ or rights, e.g. the right to an education. Somewhere in the mix fathers get marginalised. They are not a ‘survival need’ yet nor are they a powerful enough ‘want’ to make it onto the list. For as long as the ‘paramountcy’ principle is rigorously applied to the disadvantage of fathers that will remain their unenviable situation. “Shared Custody: A Comparative Study of the Position in Spain and England” Jan 2011. ← Visionary Child Support ? Mark is quite right to correct me. Andrina Hayden undertook this work as part of her Final Master’s Degree project (completed in 2009). Where I got PhD from, I feel, is not worth an internet search. I see you have asked this before and I have replied saying “Sorry, no”. Sorry Aidan, i have no contact information from Andrina.